Caramel Stuffed Banana Nut Muffins | Have YOU Ben Starr Struck? ← Guest Post: Do Food Shows Have Ethical Obligations? What’s better than a banana nut muffin? 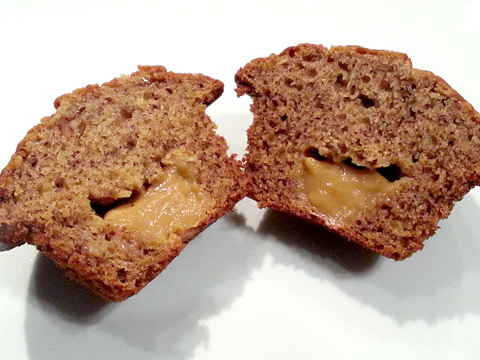 A banana nut muffin stuffed with caramel. Of course. This recipe is based on the great Alton Brown’s banana bread recipe, which I’ve tweaked to make these decadent muffins. If you’re looking for a healthy breakfast recipe, this ain’t it. Check out my whole grain low-fat banana bread recipe for that. This is for an indulgent breakfast. Latin American markets carry this favorite sweet treat, but if you can’t find it, it’s easy to make. Take a can of sweetened condensed milk (not evaporated milk!) and remove the paper label. Place the can in your pressure cooker, add water to cover the can completely, seal the pressure cooker and bring it to full, high pressure. Cook for 30 minutes. Then turn off the heat and don’t touch the pressure cooker until morning…let it drop in temperature naturally all the way to room temp. If you don’t have a pressure cooker, get one. It’s one of my favorite kitchen tools! If you can’t get one, here’s the oven method for making dulce de leche. In a pie plate, scrape 1 can of sweetened condensed milk and cover the plate tightly with 2 layers of foil. Place a pan large enough to hold the pie plate on the middle rack of your oven. Place the milk-filled pie plate into the pan. Add hot water to the pan until it comes halfway up the side of the pie plate. Turn the oven on to 425F. Bake the milk for an hour and 20 minutes, checking every 20 minutes to add enough hot water to keep the level halfway up the pie plate. After 80 minutes has passed carefully pull the rack out of the oven and pull the foil back, being careful of escaping steam. The milk should be medium brown and caramely, and smell delicious. If it’s not caramel colored, seal the foil and return the plate to the water bath in the over for an additional 10-20 minutes until it gets nicely caramelized. Let the caramel cool for a few minutes, then whisk it briskly until smooth. Line a muffin pan with cupcake liners. Gently spoon about a Tablespoon of batter into each tin. Then spoon in about a Tablespoon of the chilled caramel. Then fill the muffin tin to the rim with batter. Let these muffins cool in the pan for 10-15 minutes. Carefully remove them to a cooling rack and let them cool fully before enjoying…if you can wait that long! This entry was posted in Breakfast, Quick Breads, Recipes, Vegetarian and tagged banana, caramel, cupcake, dulce de leche, filled, hazelnut, macadamia, muffin, nut, pecan, stuffed. Bookmark the permalink.